A 77-Mineral Moist Complex that instantly nourishes lips with maximum moisture in a lightweight, non-sticky formula. Larger bullet applies bright, long lasting colour in a single stroke. Medium shine finish, buildable coverage. Magnetic closure. A while back MAC released a new range of permanent lipsticks called Mineralize Rich Lipsticks that came with different packaging, more product and were said to have better lasting power and be creamier. 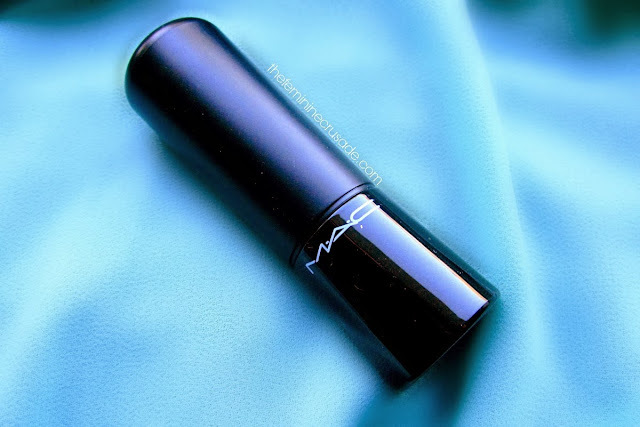 Each lipstick contains 3.6g of product where MAC's regular lipstick contains 3g. But then also these are pricier. I think there are a total of 12 shades in this range. 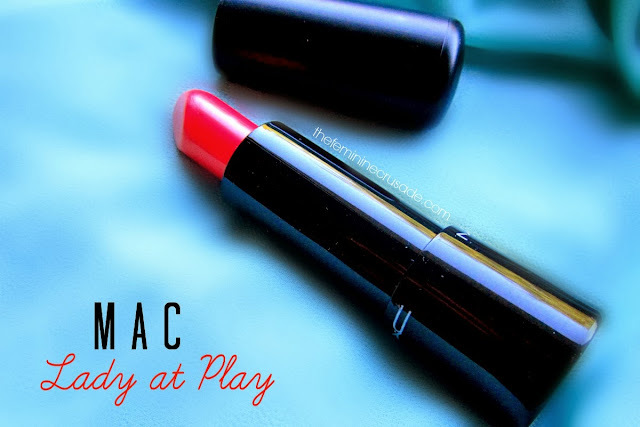 And Lady At Play is from MAC's Tropical Taboo Collection. Frankly, I like this new packaging as much as I like the old one. Though this one is sleeker, more shapely with a shinier bottom. 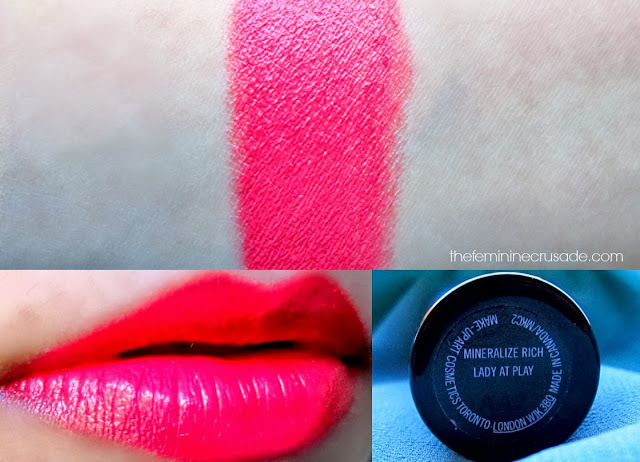 Lady At Play in MAC's words is a 'mid-tone cool tangerine'. I find it a warm raspberry-red shade with orange hues. I really find it hard to describe this colour. When I wear it I see tones of coral, orange and pink in it. Nonetheless, this colour is beautiful and can be worn all year round. It is such a fresh, bright colour that does not scream 'attention' but still pops. The formula of the lipstick is very creamy, moisturising, glossy and does not emphasize any lines. It has a buildable coverage that reaches to opacity. I find it very comfortable to wear, so much that I don't even feel I am wearing it. Also with all this hydration it has an amazing staying power of 5 and more hours even during eating and drinking, unless you are digging your teeth in a subway sandwich lol. 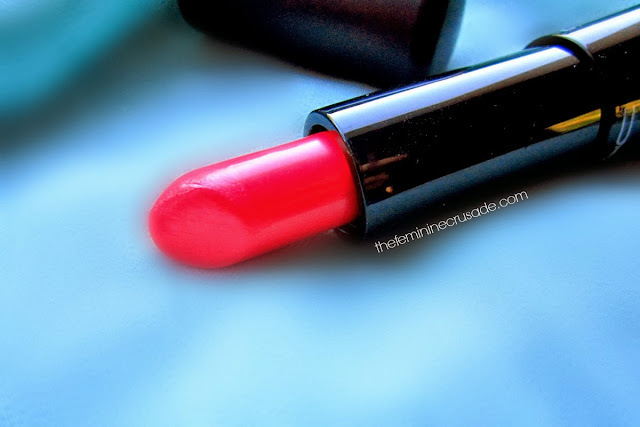 It is the best option for somebody looking for pigmented, hydrating lipsticks that last long.